For a strictly limited time, we have decided to offer 2 weeks of trial web hosting to you. We are now offering free installation of your favourite blog, content management system (CMS), e-Commerce, gallery, chat or forum software! Want to have WordPress, DotNetNuke, OSCommerce, Joomla, phpBB, Coppermine, SharePoint Foundation or other application installed? We'll do it free! Need help to install other applications (not listed above)? DotNetPark can help you install it free of charge too! Our carbon footprint has been neutralized. Both Microsoft SharePoint Foundation 2013 and 2010 (as long as hosted Windows SharePoint Services 3.0) are available for all our customers absolutely for free! Just let us know and we'll install it for you! Microsoft SharePoint Foundation 2013 (Windows SharePoint Services) is a web-based collaboration and document management platform from Microsoft. It can be used to host web sites which can be used to access shared workspaces and documents, as well as specialized applications such as wikis, blogs and many other forms of applications, from within a browser. And we now offer free SharePoint installation and even migration from other SharePoint hosting providers. Have SharePoint professionals in our team. We do not force you to buy a SQL database add-on, because all our SharePoint hosting plans already have SQL incuded! Our hosting is 100% ready for DotNetNuke 9! Any of our customers can request a free installation of DotNetNuke. You can install it with our control panel too. DotNetNuke 9 has lots of new features and improved performance. And we now offer free DotNetNuke website installation and even migration from other DotNetNuke hosting providers. Have DotNetNuke professionals in our team. We do not force you to buy a SQL database add-on, because all our DotNetNuke hosting plans already have SQL incuded! Secure your site. Boost response and customer confidence with an affordable Positive SSL Certificate. All our servers are pre-installed with DotNetPanel - our control panel for Windows web hosting with real time SQL backup and restore tool, and easy-to-use Web Applications Installer. The panel is created by our team with ASP.NET technology. Some of the features in the demo control panel have been disabled for security reasons. Do you need help to transfer your website to our hosting from other hosting provider? Our support team will do it for you absolutely free! DotNetPark support can help you on the website transfer, MS SQL and mySQL databases migration and perform it all for you at no additional costs! Over 14 years ago DotNetPark started providing web hosting services. Now we provide web hosting and applications hosting solutions to thousands of companies and organizations, as well as educational institutions, government agencies, and individuals. DotNetPark was the first web hosting company in the industry to offer shared Microsoft SharePoint web hosting services. Other companies have tried to do the same but we still do it best and at a reasonable price. We also were one of the first companies in the industry to offer DotNetNuke web hosting, starting from the first versions of this handy Content Management System. We know DotNetNuke inside and out. Our team developed DotNetNuke modules and even created a web hosting control panel based on DotNetNuke engine. No other hosting provider has the same DotNetNuke experience. DotNetPark offers web hosting on the cutting-edge hosting platform. 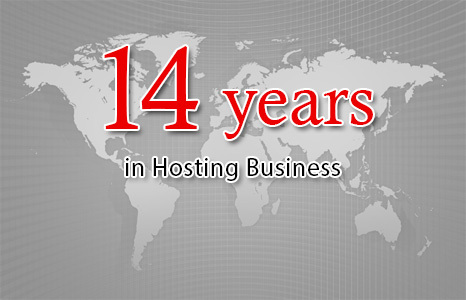 To celebrate our 14th anniversary we have upgraded hosting packages of our old customers at no additional costs. The old packages have 5 times more space and 10 times more bandwidth now! Also we will add MS SQL databases for free to the old hosting accounts. We look forward to working with you in 2017 and later years. Free migration of your websites from other hosting providers. Performed by our support team. Build you web site in minutes using DotNetNuke portal solution! Choose between different content modules, upload and publish images, apply colorful skins. DotNetNuke is made with cutting-edge technologies like ASP.NET 4.5, Ajax and MS SQL Server 2012. Use this powerful platform for knowledge management and collaboration. Community Server includes blogs, forums, photo, file, and media galleries, optimized control panel, groups, etc.! Community Server comes with integrated search across blogs, forums, photos, and files in one consistent UI. We are pleased to be among the first ASP.NET hosting providers to announce support for Graffiti CMS Hosting. All of our shared web hosting plans and Virtual Dedicated Servers are compatible with Graffiti CMS and we offer a free installation of Graffiti CMS. Moreover both MS SQL and mySQL are fully supported on our servers and you can use either with your Graffiti CMS website. DotNetPark ASP.NET SQL hosting is 100% ready for these applications! Any of our customers can request a free installation of DotNetNuke, CommunityServer, Graffiti CMS and other popular applications! Build a fully functioning website in minutes with no HTML-coding knowledge! I looked for a long time and compared many hosts before I settled on DotNetPark over 3 years ago. They continue to impress me with their top notch support, continuously updated features and their very usable control panel application. This is definitely one of the better hosts out there for Windows hosting. I have used DotNetPark to host my website(s) for the past four years. The "up time" is 100% and the support is excellent. Today I'm adding my third website. The Amazing package is AMAZING. For the price of 2 cheap hosting accounts elsewhere, I get double the MS SQL databases, double web sites, 5 times the domain names and aliases and tons of disk space. Add the generous email package and awesome web email interface and now I can cancel my email hosting plan too. The support team has gone out of their way to make sure the few problems I have had were completely resolved. I get fast servers with the most recent technology to work with. To top it off, you add the DotNetNuke based hosting control panel which makes managing my entire internet package simple and even enjoyable to do. You have definitely differentiated yourself from your competitors with your advanced technology, support and incredible value. Thanks DotNetPark! The team at DotNetPark are great. They are affordable, reliable, and up to the challenge to assist you with awesome technical support. I left a dedicated server with CI Host to come over guys. I have 40+ websites with these guys and I have never been happier! Our ASP.NET web hosting platform is Microsoft Silverlight compatible. Microsoft Silverlight offers a flexible programming model that supports ASP.NET and AJAX, and integrates with existing web applications.